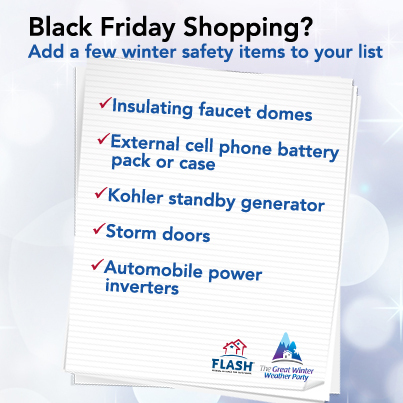 With families experiencing colder-than-normal temperatures already during the month of November and with freezing temperatures over the Thanksgiving holiday, the FLASH team suggests adding a few winter safety items to your Black Friday shopping list. There’s no better gift than one that offers your loved ones safety and protection and even has the potential to save their lives. FLASH developed a comprehensive list of winter-weather preparedness gift-giving ideas that can protect friends’ and families’ homes and ensure their safety. For a complete list of tips on how to stay safe and comfortable during power outages, click here. For more tips and resources on winter safety visit www.greatwinterweatherparty.org. 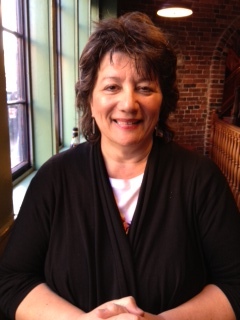 For comprehensive disaster safety and home mitigation information on weather of all kinds visit www.flash.org. TALLAHASSEE, FL — The Federal Alliance for Safe Homes (FLASH)® today shared myth-busting tips from leading experts in tornado science, meteorology and construction following the recent outbreak of deadly tornadoes in Illinois, Indiana and Ohio. Myth #1: Attempting to drive away from a tornado is a better survival plan than sheltering in place. Fact: Tornadoes do not follow a specific path or route and can change direction at any time, so attempting to drive away is an extremely risky choice. Tornadoes can turn a car into a 4,000-pound flying missile and occupants can become trapped and exposed to debris, rain, hail and/or dust. Parking on traffic lanes is dangerous and illegal, and stalled or stopped cars can block emergency vehicles. “A car is a more dangerous place to be than a well-constructed home in a tornado,” said Greg Carbin, Meteorologist for the National Weather Service’s Storm Prediction Center. The best place to shelter in a tornado is indoors. However, if you are already in your car and a tornado is approaching, know that there is no safe option, just slightly less-dangerous ones. If the tornado is visible, far away, and the traffic is light, you may be able to drive out of its path by moving at right angles to the tornado. If you are caught by extreme winds or flying debris, park the car as quickly and safely as possible — out of the traffic lanes. Stay in the car with the seat belt on. Put your head down below the windows; cover your head with your hands and a blanket, coat or other cushion if possible. If you can safely get noticeably lower than the level of the roadway, leave your car and lie in that area, covering your head with your hands. Avoid seeking shelter under bridges, which can create deadly traffic hazards while offering little protection against flying debris. Bottom Line: Develop a personal plan for safety well ahead of tornadoes and identify your safe place options at home, school and work. Start with certified shelters and safe rooms, safe spaces above or below ground, or community shelters in public spaces that are labeled as official tornado shelters like stores, malls, churches or even airports. Fact: Using a combination of NOAA weather radio and new smartphone weather alerting apps all but assures that you will receive lifesaving severe weather alert information and other emergency messages on a timely basis. NOAA Weather Radio has delivered reliable watches and warning for more than 50 years and the advent of new, smartphone GPS, precision weather notifications have added enhanced mobility, speed and accuracy for families in harm’s way. Myth #3: Nothing above ground can withstand an EF-4 or EF-5 tornado. Fact: It is entirely possible to harden and stiffen a room to withstand extreme winds, i.e. a small room, steel or concrete, or timber box equipped with a door that has been tested for pressure resistance and debris impact resistance. The National Storm Shelter Association/ICC 500 standard and FEMA guidelines provide details on how to fabricate shelters or construct safe rooms that provide near absolute life protection, even in an EF-4 or EF-5. Bottom line: Expert forensic engineering examination of above-ground shelter and safe room performance during the 2011 Tuscaloosa and Joplin outbreaks as well as the May 20, 2013 Moore, Oklahoma tornadoes documented that properly constructed shelters and safe rooms consistently survive super tornadoes. “In my 15 years of doing storm damage research and storm shelter research, we have never documented any deaths or injuries in above ground tested safe-rooms or failures of tested safe-rooms. This includes the storms of Joplin 2011 and Moore 2013,” Larry Tanner, Texas Tech University Department of Construction Engineering and Engineering Technology. Myth #4: Building codes cannot make a difference in tornado outbreaks. Fact: Even if the tornado is EF-4 or EF-5, 95 percent of the damage occurs at EF-3 and below. What this means is that the minimal construction standards required by building codes can make a meaningful difference if they are adopted and enforced. Moreover, since 90 percent of all tornadoes never exceed EF-2, wind resistant building practices like those included in the 2012 International Residential Code can dramatically improve building performance in tornado outbreaks. Bottom Line: Homes built to modern, model codes will have the advantage of better wall bracing, improved roof tie-downs and overall stronger connections. “If we can put a man on the moon, we can keep a roof on a house,” said Dr. David Prevatt, Assistant Professor University of Florida Wind Department of Civil and Coastal Engineering. Myth #5: We cannot affordably build to withstand tornadoes. Fact: The National Climatic Data Center estimates that 77 percent of U.S. tornadoes are in the EF-0 to EF-1 range and 95 percent have wind speeds less than EF-3 intensity. A recent cost study revealed that using an average of $0.50 per square foot or $1,000 in metal connectors installed from a home’s roof to its foundation could upgrade a home’s ability to withstand wind uplift from an EF-0 to an EF-2 tornado. Bottom Line: Approximately 90 percent of tornadoes are at the EF-2 level or lower. “An increase in baseline construction costs of just $.50 per square foot can boost a structure’s wind resistance from EF-0 to EF-2 levels,” said Randy Shackelford Research Engineer/Code Specialist Simpson Strong-Tie. A minimal investment of $.50 per square foot or $1,000 for a 2,000 square foot home will help save lives and minimize property damage. To learn more, visit www.flash.org. Federal Alliance for Safe Homes (FLASH)®, a 501(c)3 nonprofit organization, is the country’s leading consumer advocate for strengthening homes and safeguarding families from natural and manmade disasters. FLASH collaborates with more than 100 innovative and diverse partners that share its vision of making America a more disaster‐resistant nation including: BASF, Federal Emergency Management Agency, Florida Division of Emergency Management, The Home Depot®, International Code Council, Kohler® Generators, National Weather Service, Portland Cement Association, RenaissanceRe, Simpson Strong-Tie®, State Farm™, USAA® and WeatherPredict Consulting Inc. In 2008, FLASH opened the interactive weather experience StormStruck: A Tale of Two Homes® in Lake Buena Vista, FL. Learn more about FLASH and gain access to its free consumer resources by visiting http://www.flash.org or calling (877) 221- SAFE (7233). Also, get timely safety tips to ensure that you and your family are protected from natural and manmade disasters by subscribing to the FLASH blog – Protect Your Home in a FLASH.